James Guzman and Ben Vincent write: In 2008 the prospective career paths for much of America went up in smoke as jobs became more and more sparse. Many, still desperately clinging to the fantasy of the American Dream, are getting money the only way that they know how; borrowing it. What better way to fund your lifestyle and prepare for a new career than getting a loan to go to college - right? But what if there’s no one to lend that money? Early this month JP Morgan announced that they will be exiting the student loan market as of this October stating, "We just don't see this as a market that we can significantly grow," making it clear that the student loan market is truly dysfunctional. Don’t worry though; the government has come to save us from what Keynesian economists would call this “market failure” by currently issuing over 90% of student loans. Reminiscent of the housing bubble in which there was an underlying societal myth that everyone should own a home and that all houses were good investments, this bubble is fueled by the myth that everyone should go to college and that all college is a good investment. Just like the housing bubble this is believed by just about everyone until it’s not - and then it’s too late. The culture, and of course government schools, tell the youth (and older displaced workers) that in order to get a good job one only needs to go to college. Colleges, much like the National Association of Realtors during the housing boom, take advantage of this combination of government subsidies, cheap credit and free marketing (propaganda) to fuel a speculative bubble. 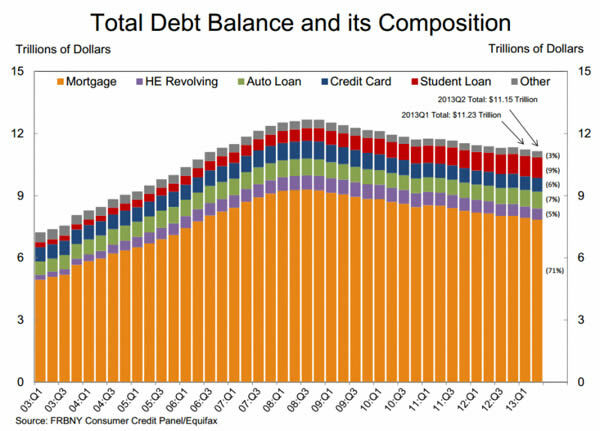 In the past decade college debt as a percentage of household debt has exploded becoming the second biggest form of household debt outpacing credit card and auto loan debt. In this article we will go through the perverse incentives that have created this unsustainable boom and put forth some predictions about how the whole thing may play out. As the readers of The Dollar Vigilante will surely realize, the college debt fiasco we are currently in has nothing to do with the free market and everything to do with government meddling. No one in their right mind would loan money at 2-3% interest to an 18-year-old with no collateral or experience to pursue their education in whatever they choose, unless of course you could just create the money out of thin air and had some friends in the university cartel. The GI Bill, federal grants, state grants and government guaranteed student loans have made university tuition prices go into the stratosphere. The once romantic idea of putting yourself through college by waiting tables is now just a memory from decades past. As with any time that market forces are absent we see not only the price climbing but the quality of the degrees themselves diminishing. The quality of most of the degrees today are so removed from any type of marketable skills that in many cases it could be seen as a negative for someone to have wasted so much time and money to have gone to university at all. This hilarious video by Peter Schiff demonstrates perfectly how utterly worthless most degrees have been to obtain the high paying job that was said to come about by possessing one of these sacred documents. There have been many factors that have been at play to cause this market to be perverted in such a way. You could more accurately call most degrees “Union cards” as they act as a state-sanctioned conditioning seal of approval for the union leader of the specific field the student is entering. Although there are great classes online for free, in order to get an accredited degree you must attend one of the approved Universities. Getting a degree from one of these accredited schools is of course a prerequisite for the next hoop you must jump through; getting a license to practice. Once the university cartel has been established the only thing left to do is to hand out cheap money. This has been done through a variety of ways but mostly through federally guaranteed or directly issued student loans. Under the old federal lending program loans were made by private banks with federally backed guarantees. Many financial institutions wanted out of the market so in 2010 President Obama attached an overhaul of the student loan program to the Health Care and Education Reconciliation Act. This overhaul was in essence a takeover of the student loan market by the federal government by stopping the subsidies given to the banks to make the “private” loans and instead have the government lend the money to the student directly. Along with this they increased Pell Grants and allowed students to only be liable to pay 10% of discretionary income for loan repayment, the loans could then be forgiven after 20 years of timely payments. 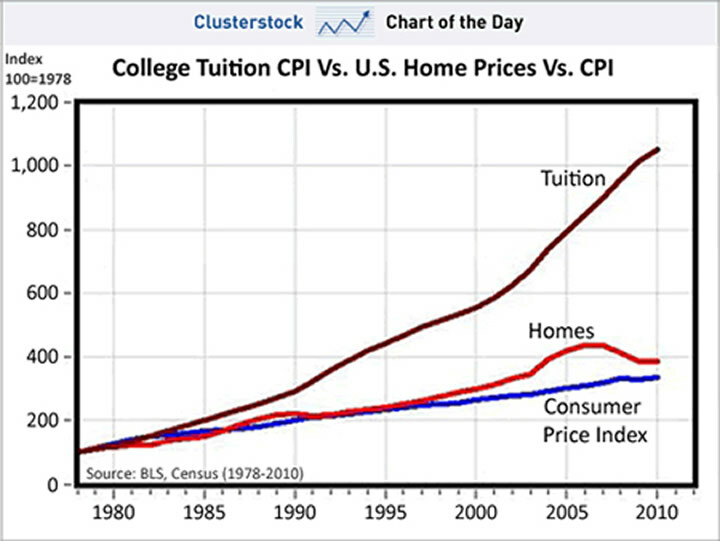 This excess of cheap credit in this specific market has caused college tuition to rise dramatically faster than the rate of inflation. This has not dissuaded student borrowers however as student debt is now twice what it was in 2007 at just over a trillion dollars, surpassing credit card and auto loan debt. As the fundamental economic conditions have not improved and with youth unemployment at 20+ percent the delinquency rate of these loans have been on the rise. Some state the rate of loans that are behind 90 plus days are reported as 13% while the Federal Reserve itself admits that the actual number is probably more than double that. This is a trillion-dollar credit market in which the government holds the majority of the loans and to which young people with no collateral who are now mostly unemployed or underemployed in an economy that has no chance of improving are left to hold the bag for. This is not a black swan but rather a giant gorilla staring in the face of the entire nation that most people choose to ignore. Comments or questions? Email us at TDV@dollarvigilante.com and we may use your email in our Feedback Friday each week. James Guzman is an American born writer and investment consultant specializing in non-conventional markets and countries. He is a staunch advocate of the free market and has extensively studied the Austrian school of economics. James manages TDV groups and is the TDV correspondent in Acapulco, Mexico, if you have any questions on moving or investing in Mexico you can contact him at jguzman@dollarvigilante.com.